Bring a cohesive look to your neighborhood mail collection with this Whitehall Black Quad Personalized Mailboxes Package. The hardy, aluminum construction, streamlined frame, and black color of this kit lend classic style to your curb in moments. Two 74" tall, aluminum uprights slide over wooden 4 x 4 posts (not included), creating a fantastic station. A 54" long, horizontal beam spans the space between these uprights, and connects to them using the included hardware. Attach the 4, included aluminum mailboxes to this beam, creating a dramatic and convenient mail collection spot. The boxes are approved by the U.S. Postmaster General, and each is 20% larger than standard units, for holding plenty of mail. Differentiate the mailboxes by adding a customized front panel to each. These individually made panels can all hold up to five 1.75" tall characters, and the gold hue of the personalization matches the gold colored flag on each box. The receptacles also sport a magnetic closure door to keep your mail secure, and a small orb atop them echoes that of the posts. Crafted from durable aluminum, this station will remain lovely for many seasons, while the black finish lends it a timeless look. 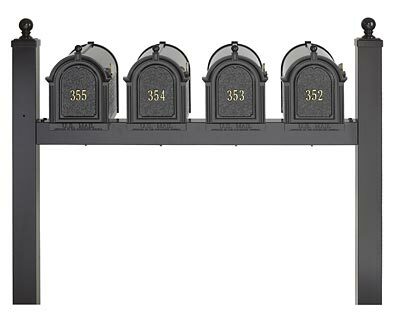 Create a beautiful neighborhood mailbox station using this Black Quad Personalized Mailboxes Package. Assembly required.